Bangladesh National Women Team started their practice session today at Mirpur for the upcoming qualifying round of the World Cup. 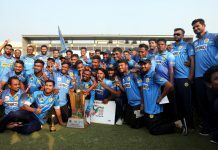 The qualifying round will be held at Sri Lanka and top three teams of each group will qualify for the super six round and finally top four teams of the super six round will play the World Cup at England. The other members of Bangladesh group are South Africa, Pakistan, Scotland and Papua New Guinea. After playing ACC T20 Asia Cup in Thailand, the team members passed holidays in the meantime. The first match against South Africa Women will be held on January 12.